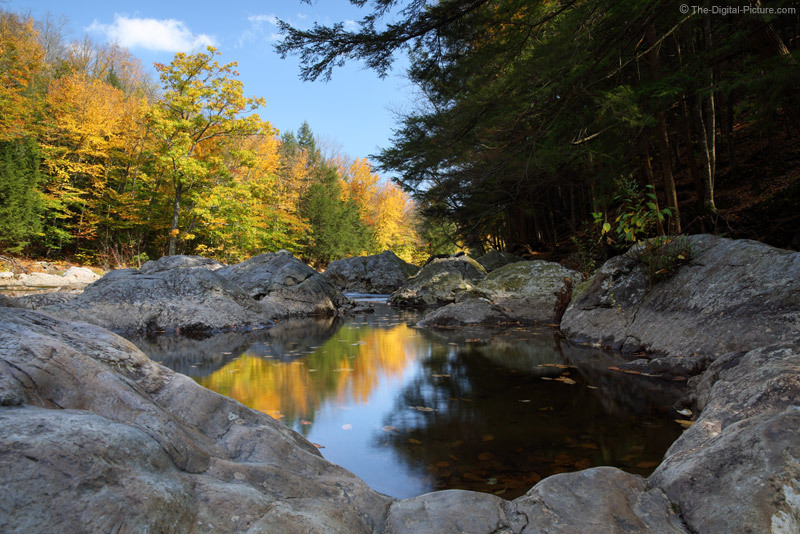 Fall foliage reflects in the still water of "The Haystacks" on the Loyalsock Creek near Worlds End State Park. I have frequently carried split neutral density filters with me, but I rarely find myself using them. Primarily because I seldom shoot scenes with a straight line between the portion of the frame I want to darken and the portion I want to lighten. Also, the amount of difference in exposure needed varies greatly. And, the white balance is often different in the two (or more) sections of the frame. This image is of a typical-for-me scene that needs a portion of the frame darkened. For this image, I shot two frames - one exposed for the background trees and one for the in-the-shade rocks. The exposed-for-shade image was given a warmer white balance and a small saturation boost. In Photoshop, I overlayed the exposed-for-the-sun frame with the exposed-for-the-shade frame, creating two layers. I then used a very soft eraser brush to removed the overexposed portion of the top layer to expose the bottom layer. This technique is very easy - and the results can look great - and natural. Do note that, if you have a subject in the frame that is moving, this technique only works well if that motion is fully contained in one of the two layers. A CP filter was used for this image. I'm still debating between cloning out the floating leaves or leaving them in.